Wrestlemania and The Undertaker go hand in hand. 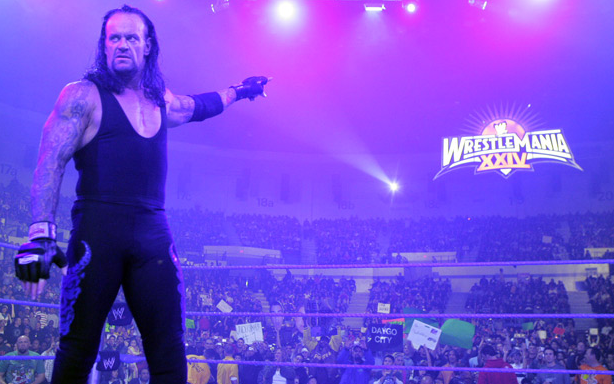 You cannot think about Wrestlemania without thinking of The Streak and the Undertaker. 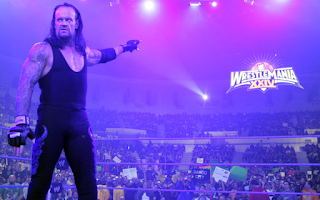 Today, I wanted look at the long history of The Undertaker at WrestleMania. -The debut Mania match for Undertaker. 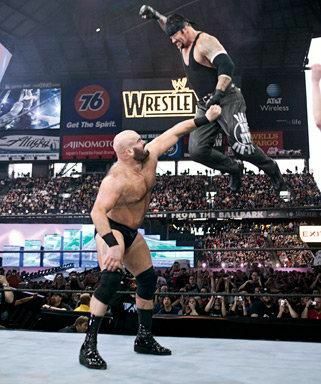 This was just the usual with Taker squashing a Hall of Famer. Nothing to see here. -A friendship turned sour. 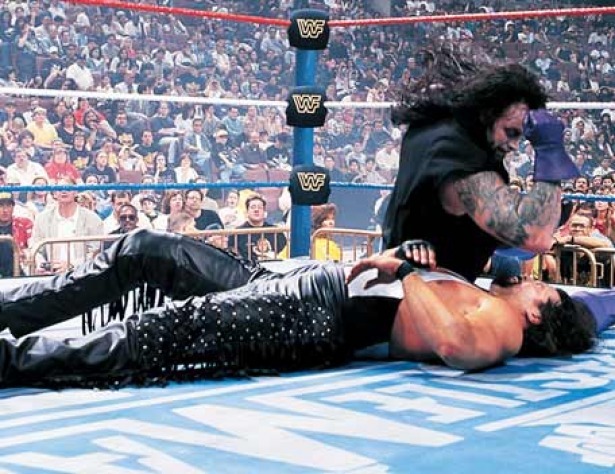 The Deadman and the Snake would do battle in nothing more than another (albeit longer) glorified squash. Another victim. -One freak meets another. 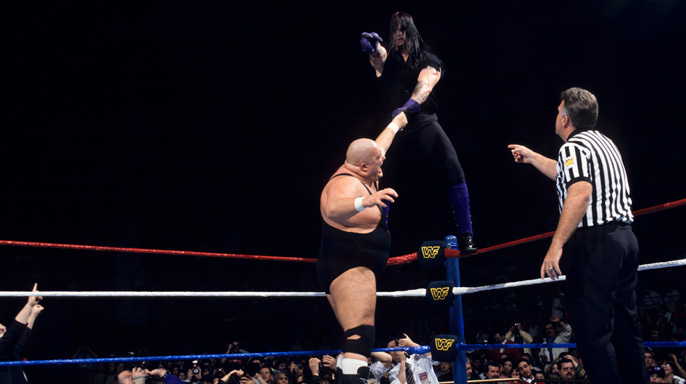 Undertaker was always tasked to take on the freaks and the weirdos and this was no exception. 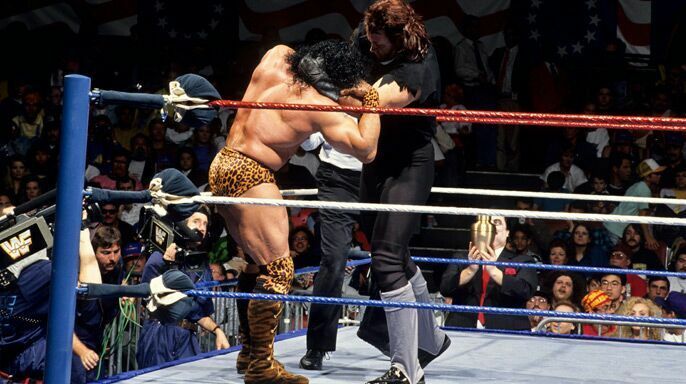 This is the only time Undertaker would win by disqualification at the event. -The Phenom was in the midst of a feud with the Million Dollar Corporation (1995 was such a bad year for WWF) and Bundy was one of the few guys not feuding with anyone of importance, so I guess there's the logic. Taker wins handily here. 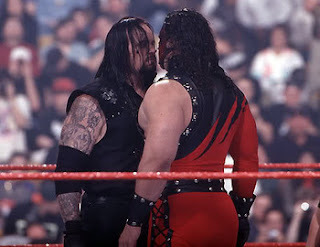 -IMO, this is the most underrated match in Taker’s Mania catalog. Both men screwed each other out of WWF title matches to lead us here. A battle of two big men which ended up being an borderline classic to me. 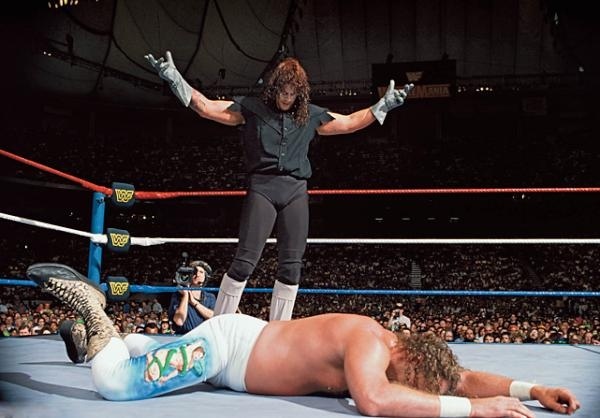 -This was the first time Undertaker would challenge for the WWF Title at Wrestlemania. 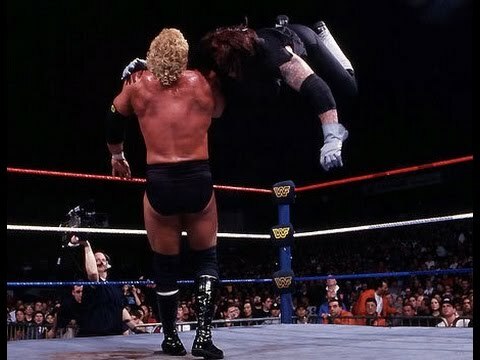 Undertaker would have what I believe was a stellar match with Sid (Editor's Note: This is seen as one of the worst Mania main events ever by many, but there's always people who like those matches). I think Sid doesn't get enough credit and neither does this match. -Brother against Brother. Undertaker’s borther would return and haunt him until they had a match. Taker would finally oblige and they would meet in a GREAT confrontation. -The first time in the history of Mania where a match would be contested in Hell in a Cell. While that sounds big, this match disappointed. A lot of it had to do with time constraints and the placement on the card. Taker wins and gives us an image WWF probably wasn't too proud of. -A classic. Hands down. HHH was WWF’s best heel and had been for a long time. After missing WM16, Taker came back, laid down the challenge and they both would bring the house down. 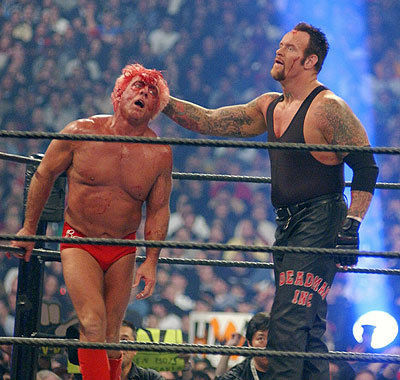 -Apparently the Undertaker lobbed for this match and it was surprisingly good considering Flair had ring rust. "Double A" Arn Anderson hitting the spinebuster is my favorite part of the match though, but it was a very good contest. 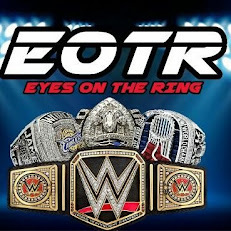 -While this is not a technical masterpiece and it should've just been Big Show vs Taker, it was a solid enough outing. -Kane was on a rampage the entire year of 2003 and his brother was the only person who could stop him in what was a glorified squash. Kane became the first man to face Undertaker twice at Mania, and the first to lose twice as well. -This was really the first time this was referred to as The Streak. There was so much emphasis placed on Taker being undefeated. Orton and Taker would put on a 4 star match and tear the house down. Orton solidified himself as a main event guy here. -The first time in Wrestlemania history there would be a casket match at the event. Mark Henry was receiving somewhat of a monster push and of course the only person who could stop him was The Undertaker. While not a classic or anything close to it, this is still a solid outing to me. 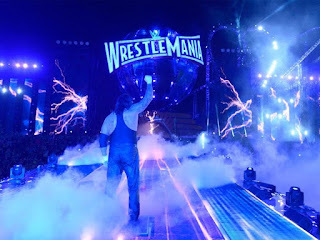 -This was only the second time The Undertaker would be vying for the World Title at Mania. After winning the Royal Rumble, Undertaker would put his streak on the line against Batista’s World Heavyweight championship. This was a STELLAR bout as both men would basically steal the show. -Undertaker would again be in the main event for the World Heavyweight Title at Mania. This time it wasn't about the Rumble or really earning a shot, this was about destroying Edge. Edge had been a thorn in Undertaker’s side for almost a year prior. They would meet in a very stellar championship bout. This would be the first time Undertaker would win a Mania match via submission. -The Greatest Match Ever. Period. You already know this. I know this. 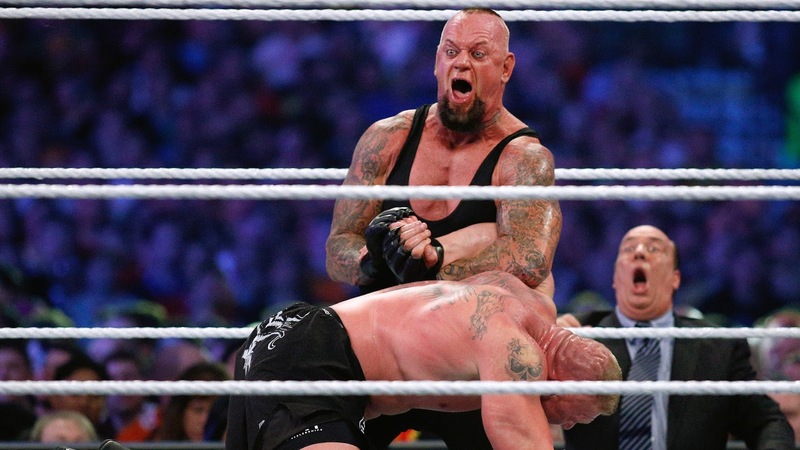 From start to finish, this is the epitome of a perfect match and Taker emerged victorious. 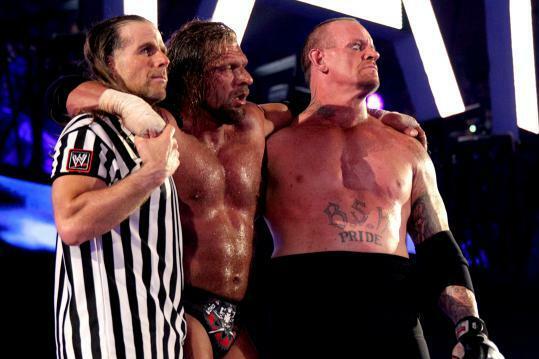 -After creating the best match ever the year prior, these two rematched the following year. While it is not as good as the first match this was still a great match. This would mark the first time Taker would main event a Mania without the title being on the line. -I was a bit skeptical of this match because both men essentially became part time performers in 2010, but they delivered a CLASSIC. One of the best matches I've ever seen. It would mark the first time Taker looked vulnerable as he was the victor, but he also was a victim. -Only the second time HIAC would appear at Wrestlemania, but one of the few times in the history of HIAC that the match would have a special guest referee. This might be the best HIAC match ever as the two most accomplished HIAC combatants would finally do battle in the structure and quite frankly had a classic. -One of the best matches I've ever seen. Undertaker couldn't carry a match like he used to but CM Punk is one of the best at that. 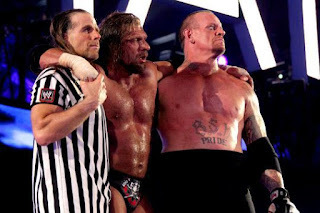 It only made sense for this match to happen and with Paul Bearer’s unfortunate passing, this match took on a little more meaning. -The most infamous match in WWE history. I think we all know what happens here (Editor's Note: The match itself isn't very good, but the moment makes it big), and it will never be forgotten. -Somewhat of a passing of the torch. Undertaker looked way better in this match than the prior match the previous year. Bray Wyatt had an injury but he did the best he could and gave us a solid match. -The return of the prodigal son was cause for Vince to bring out the heavy guns and that's his most loyal employee in his most famous match, the Hell In A Cell. 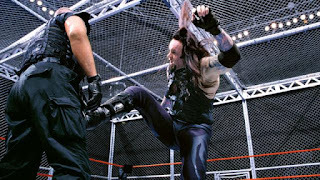 This match was pretty good considering the circumstances (Editor's Note: Also a bit too damn long), and Taker gets the victory while Shane gets the most memorable moment in the match for jumping off the cage. -The send off. The final gun fight for the gunslinger. The streak started with a member of the Samoan dynasty and the last Mania for Taker ended with a member of the Samoan dynasty. Reigns would achieve the biggest victory of his career but the real moment came after the match was over. Despite many not being a big fan of the match (Editor's Note: It's one of the worst Mania main events ever and that cheapens this whole thing), the aftermath was the best sendoff that The Undertaker could have. Let's try to remember that moment more than anything.